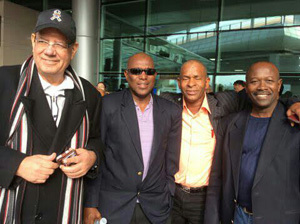 GBA President Steve Ninvalle is flanked by St Lucia’s David ‘Shakes’ Christopher (2nd right), Grenada’s Ralph James (right) and VP of Egypt Boxing Association Mohamed Aly Elsayed Touma following their arrival in South Korea. South Korea for the AIBA Congress held from Tuesday to Friday. He is hoping to be elected to the AIBA Americas Executive Committee, where Guyana and the Caribbean would have a major voice in the operation of the world of amateur boxing. It is a very tough race as Ninvalle will be up against other influential candidates from several developed countries. Ninvalle confirmed to this newspaper his arrival on Monday and they were into the business of charting the way forward for the world boxing body, which will be followed by the all important elections. The Caribbean association reps met yesterday and decided that Ninvalle and Kathy Harper-Hall of Barbados will speak at a meeting of associations on behalf of the Caribbean today. Prior to his departure the GBA head spoke about the race to be elected on the AIBA executive. “It is basically a David versus Goliath scenario. You are going up against the might of the boxing world. It’s a lot of politics being played out and a lot of resources being pumped into winning. Quite frankly neither Guyana nor the Caribbean is capable of matching the resources of some of the opponents,” Ninvalle had declared. Among the other members vying for positions on AIBA include: Osvaldo Bisbal (Argentina), Pat Fiacco (Canada), Rafael Vega Rodriguez (Costa Rica), Alberto Puig De La Barca (Cuba), Alex Gonzalez Gutierrez (Ecuador), Ray Silvas (USA) and Fran Lopez Almeida (Venezuela). Once successful, Ninvalle will be a vice president in the Americas area, which is led by AIBA vice president and area President Dr. Domingo Salano. This is the first time that a representative from the English speaking Caribbean has been nominated for this crucial election of the World amateur boxing body (AIBA). The elections have been fixed for Friday.